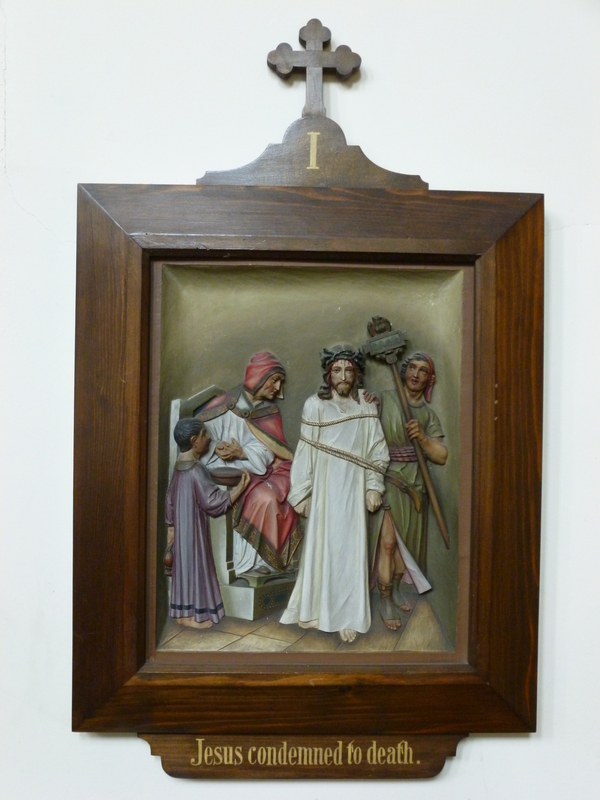 Like many Anglo-Catholic churches, St Michael’s has a set of 14 painted carvings depicting biblical and legendary events on Christ’s painful journey from Pilate’s palace to his Crucifixion at Calvary. Our meditation on the Stations of the Cross on Spy Wednesday in Holy Week at 6pm is enhanced by beautiful, devotional music. Last year the Stabat Mater by Pergolesi. 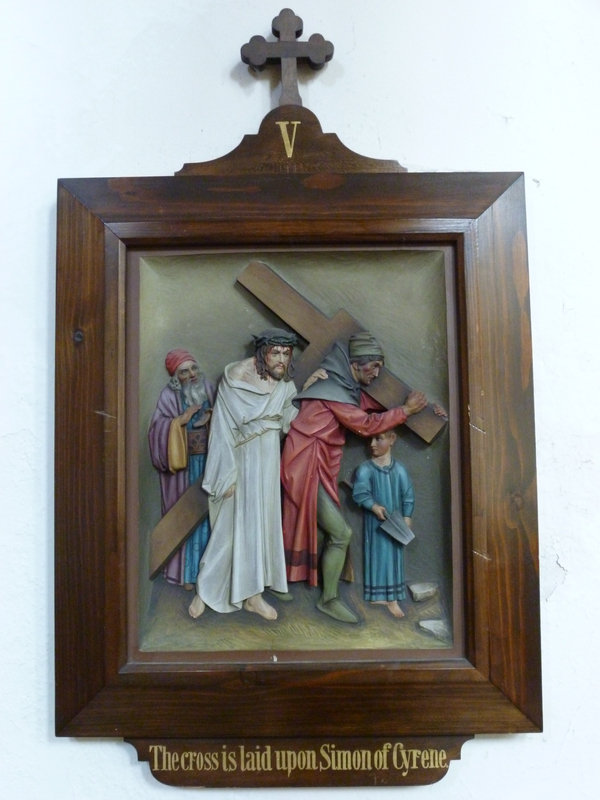 This year the Via Crucis by Liszt. Here is a link to our Holy Week Services & Music for 2018. 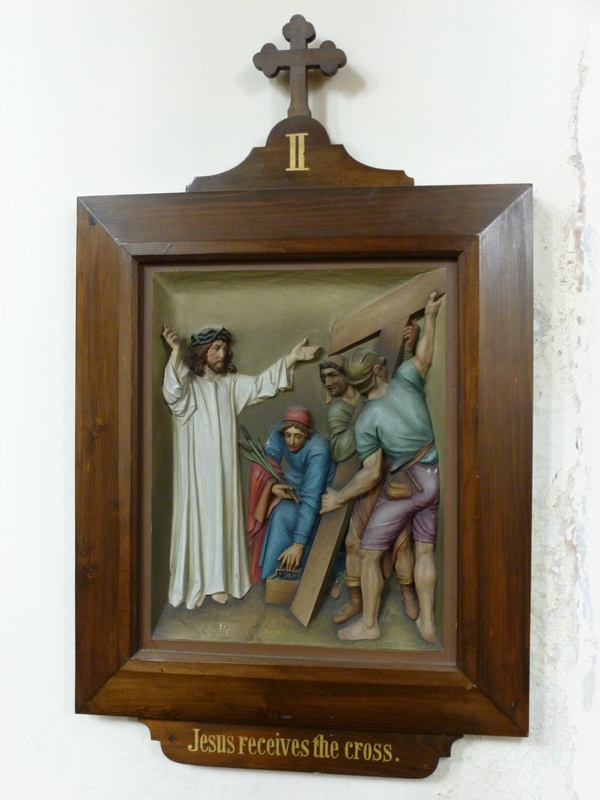 As Canon Thurmer used to remind us, the Stations are designed as much for prayerful meditation as to tell the story most of us think we know; hence Jesus wears the white robe of martyrdom rather than the bloodied rags of rejection. 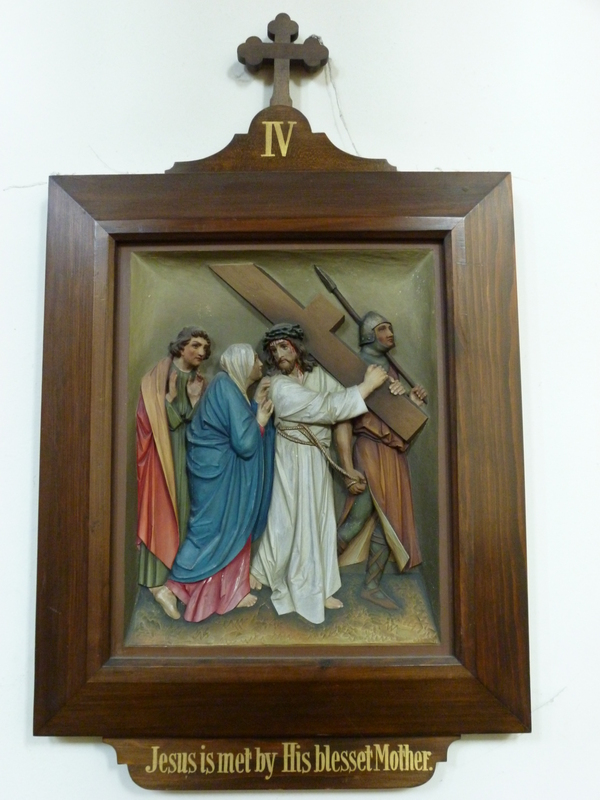 Below I have attached some of Rev J Sparrow-Simpson’s words from Sir John Stainer’s oratorio “The Crucifixion” to each image; an experiment, to reduce and re-order Stainer’s music, which I love singing, to illustrate the Stations of the Cross. The rather sentimental Victorian words and music are not to everyone’s liking, I know, but I offer them as a meditation; for the full audio-visual effect, add a suitable recording of Stainer’s Crucifixion. Click on images to enlarge if you wish. Richard Barnes. Could ye not watch with me one brief hour? Could ye not pity my sorest need? Ah! If ye sleep while the tempests lower, surely, my friends, I am lone indeed. And they laid their hands on him and took him, and led him away to the High Priest. And the High Priest asked him and said unto him, Art thou the Christ, the Son of the Blessed? Jesus said, I am: and ye shall see the Son of man sitting on the right hand of power, and coming in the clouds of heaven. Then the High Priest rent his clothes and saith: What need we any further witnesses? Ye have heard the blasphemy. And they all condemned him to be guilty of death. And they bound Jesus and carried him away, and delivered him to Pilate. And Pilate willing to content the people, released Barabbas unto them, and delivered Jesus, when he had scourged him, to be crucified. And the soldiers led him away. Fling wide the gates! For the Saviour waits to tread in his royal way; He has come from above, in his power and love, to die on this Passion day. His cross is the sign of his love divine, his crown is the thorn-wreath of woe, He bears his load on the sorrowful road, and bends ’neath the burden low. Surely he will know our need. 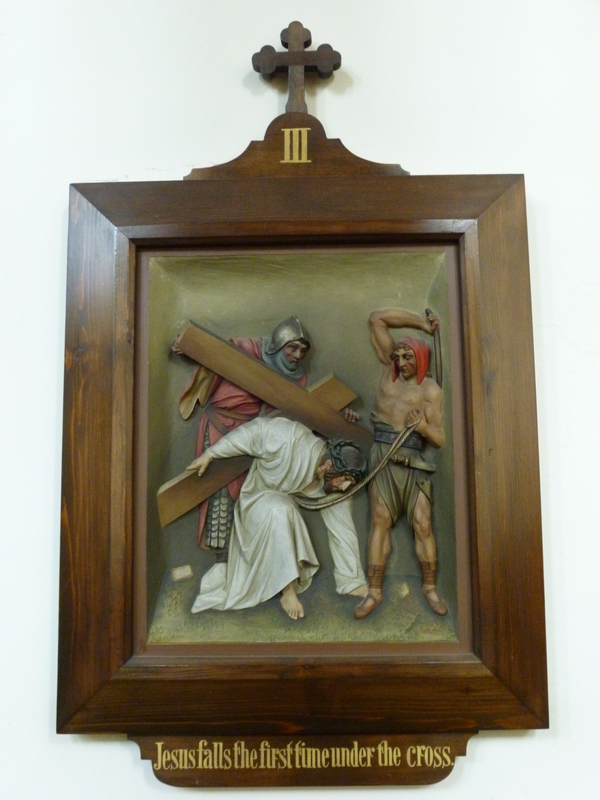 He made himself of no reputation, and took upon him the form of a servant, and was made in the likeness of men: And being found in fashion as a man, he humbled himself, he humbled himself, and became obedient unto death, ev’n the death of the cross. And as Moses lifted up the serpent in the wilderness, even so must the Son of Man be lifted up; that whosoever believeth in him, should not perish, but have everlasting life. For the next 5 Stations, click here.